Wondering how to have a smooth morning routine? Learn the best tips to rock a morning routine for toddlers and finally have a stress-free start of the day! You’d think one hour would be enough, but according to my toddler, no amount of time would make our mornings at home any less hectic. My husband and I would try to get all three kids out the door on time before school. I figured one hour would be enough to get through our morning routine. Except every morning seemed to have some degree of drama. A tantrum would erupt out of nowhere, and I’d even hear myself giving empty threats (“If you don’t get your shoes on right now, you’re not going to school!”). I needed to find ways to make our mornings calmer and more enjoyable. Losing my temper only made me feel bad the rest of the day (and I’m sure the same could be said for my toddler). Even with what I thought was a solid morning routine, I was still struggling to get out the door. Perhaps you also know you need a morning routine for toddlers to get you through these challenging stages. You feel like you can’t get your act together, making mornings that much more of a mess. Yes, your child could outgrow this stage, but you can also do plenty to create a morning routine for toddlers to help him along. In fact, that’s exactly what I did. I knew I didn’t want this to be the norm, so I set out to create a routine that would make our mornings smoother. And it worked. Mornings are now calmer and more consistent. I don’t have to nag, listen to whining, or start my day in a terrible mood. Sure, not every morning is perfect, but these simple tweaks were enough to truly transform our mornings. Many of us think we have a morning routine, especially since we tend to do the same things every morning. But how much of those tasks are exactly the same, down to the time your toddler wakes up and the order she does them? For instance, wake her up at the same time every day (even better: put her to sleep the night before at the same time every night). Do the same tasks in the same order, even down to the things she does with each task. If the first thing she does is use the potty, have her close the seat, flush the toilet, pull up her pants, and wash her hands each time—in that same order. You’ll need to guide her through the order of events, especially in the beginning, but with enough consistency, she’ll know exactly what to do on her own. With a predictable routine and ingrained habits, you’ll no longer have to nag her to do these tasks. At some point, your morning routine can be flexible to accommodate things that come up. But if you’re dealing with power struggles more than usual, try to keep it as consistent as possible. Learn the benefits of using toddler routines to structure your day. Mornings can be especially tough because so much has to get done in a short time. We’re also just waking up from a long night and may not be alert and focused. That’s why talking about “the plan” with your toddler can make a huge difference in your morning routine. Starting the night before, let him know what you plan to do the following morning. Go over the sequence of tasks and details (“We’ll have oatmeal with strawberries” or “Tomorrow is Crazy Hair Day so we’ll style your hair”). Including him in the plan not only gives him an idea of what to expect, but makes him feel included—and more invested—in how the morning goes. Now that you’ve gone over the plan with your toddler, continue to make the transitions from one task to the next smooth with reminders. Giving him a “head’s up” as he’s doing the tasks provides a friendly way to remind him what to do next—minus the nagging. For instance, let’s say you’re getting him dressed for the day. As you’re doing so, you might mention, “After we finish dressing, we’ll brush your teeth next.” Reminding him what to do next—as he’s finishing his current task—keeps his focus on the next task. 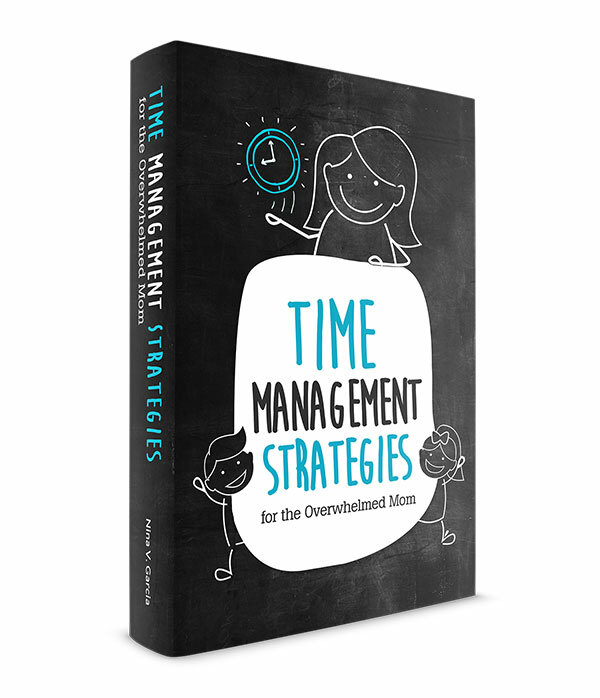 For now, stick to just one task at a time to prevent him feeling overwhelmed. He likely won’t remember a long list of what to do, but can certainly draw his attention to the next task ahead. 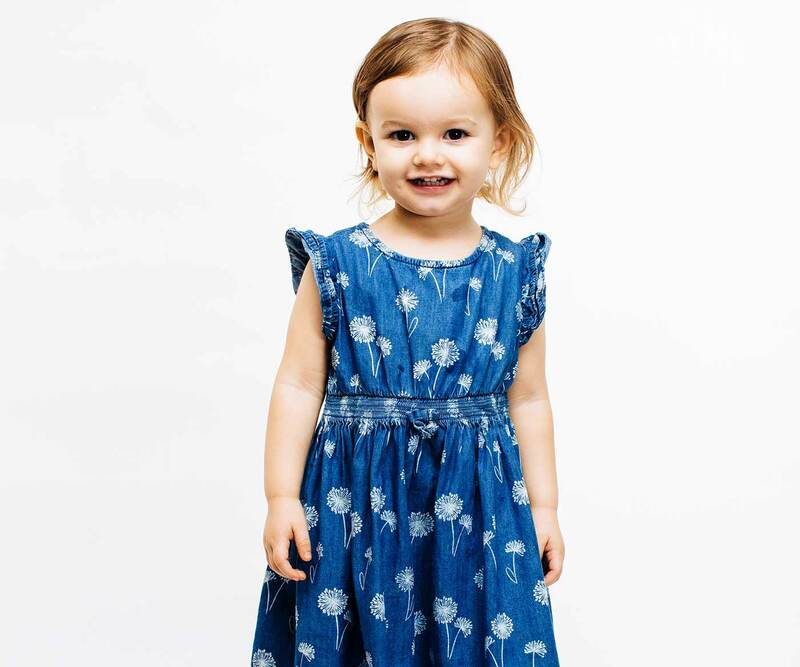 Get more tips on how to help your toddler with transitions. A simple trick to get your toddler to complete his tasks is through visual reminders. After all, even we adults benefit from calendars, planners (I use an Erin Condren Life Planner), to-do lists, and other reminders of what we need to do. It takes all that information out of our brains so we’re not so overwhelmed. The same is true for toddlers. While your toddler may not have his own planner, he can still use visual reminders to know what needs to be done. Illustrations or simple word printables are fantastic ways for him to learn discipline and initiative, all while making the mornings more fun. I also hung a white board by my front door that even now my kids and I find useful. I list the days of the week along with important reminders, such as library books to return or after-school activities to attend. Like consistent routines, visual reminders take the nagging out of the mornings when your toddler can see for himself what he still needs to do. Struggling with getting your kids to clean up their toys? Want to develop good habits from the start? 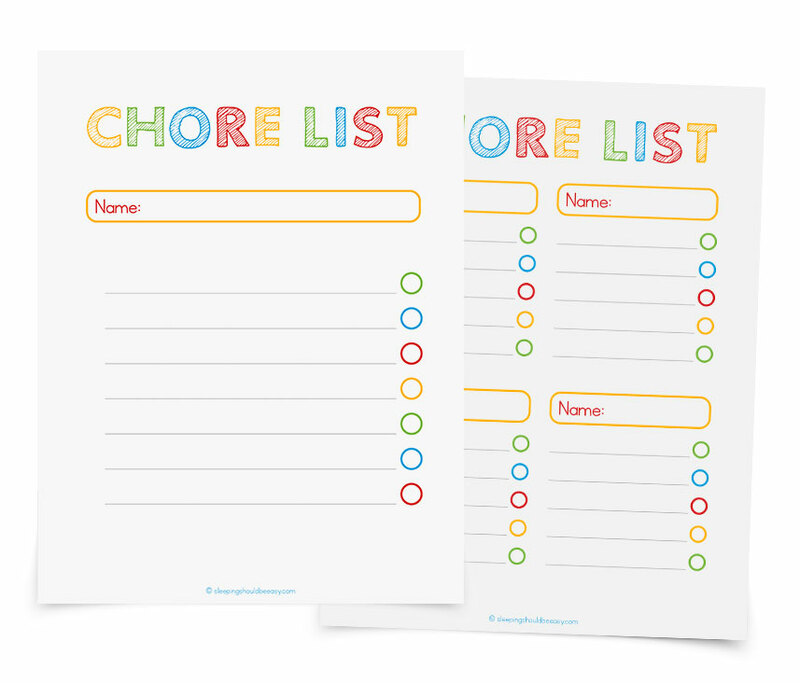 Join my newsletter and download my Printable Chore List templates to help you and your kids organize chores! Even on busy school days, I make sure to include play time in the mornings—usually about 30 minutes. But as much as my kids would rather head straight to their toys or art supplies, I make sure to reserve that until the end. 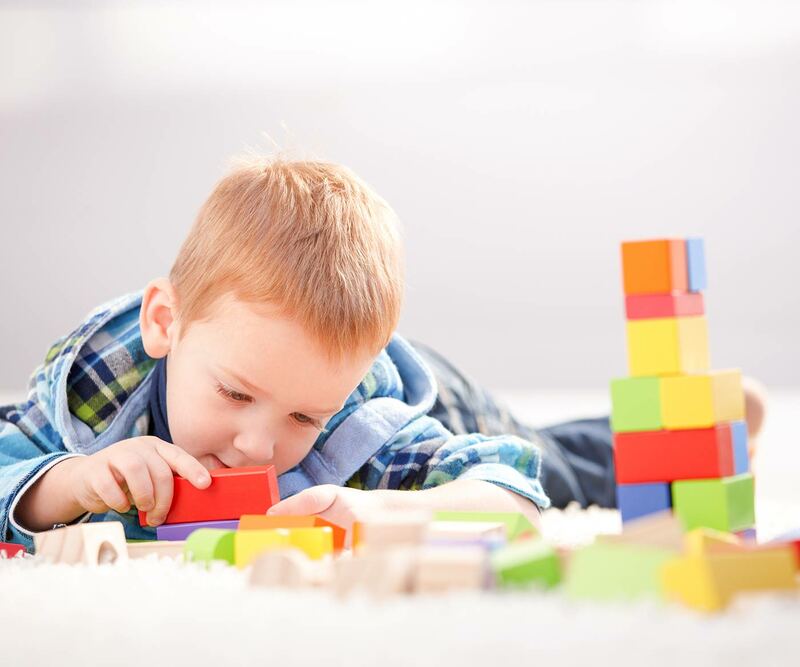 Convincing a child to continue with tasks when he’s so deeply immersed in play is cause for a meltdown or tantrum. And play time becomes the “reward” for getting all his morning tasks done. 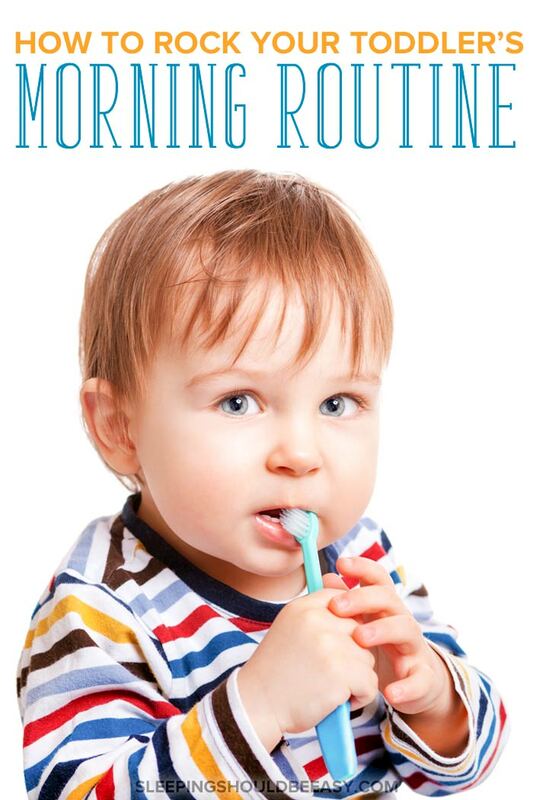 Getting your toddler to brush his teeth becomes much easier when he knows he’s guaranteed a time to play right after. And if your mornings are too hectic to include play time, consider rearranging your sleep and wake-up times to accommodate it. Your toddler’s cranky mornings may just be a result of not enough down time in the mornings, or feeling rushed in a short period of time. 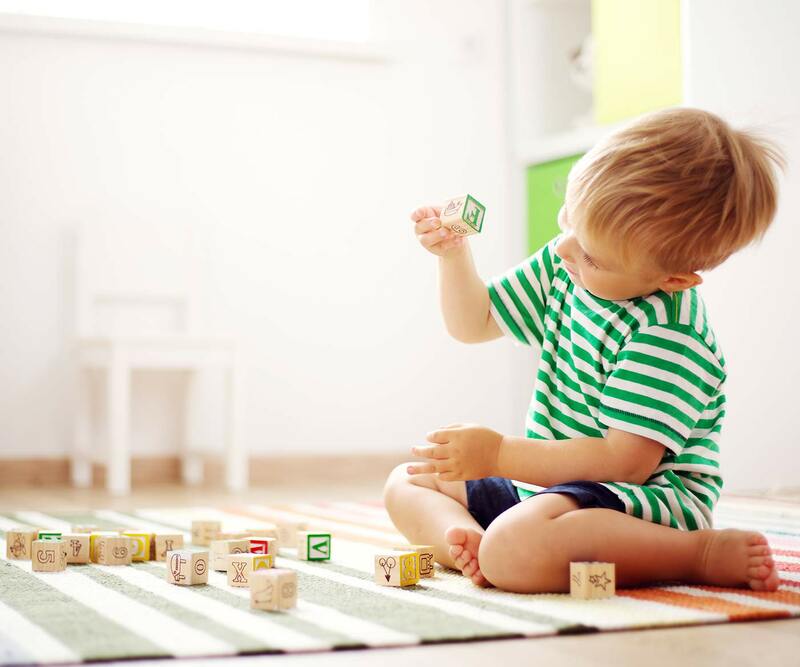 Learn how to encourage open-ended play with your toddler. Are your mornings feeling extra frantic because you’re doing your own tasks alongside your toddler? Avoid feeling overwhelmed by having everything ready before he even wakes up. For instance, prepare breakfast and get yourself dressed long before your toddler’s wake-up time so you can focus on him once he wakes up. You’re better able to guide him through his tasks without worrying about completing ones of your own. You can even get ready the night before, such as laying out clothes and packing lunches (both yours and your toddler’s). Don’t worry—as your toddler adjusts to mornings, you can allow him to assume his own tasks without too much of your attention. But for now, as you’re setting expectations for his morning routine, getting your own tasks out of the way can free your mornings more. As you can see, creating a morning routine for toddlers can mean simple tweaks with transformative results. Start by sticking to a consistent routine every morning to set expectations for both of you. Go over the plan ahead of time, and guide him through the transitions. Visual reminders like checklists and illustrations encourage discipline and initiative, while keeping play time rewards him for getting things done. And finally, have everything ready ahead of time, especially on hectic mornings, to free your time even more. I’m happy to report that shortly after implementing these tips, my mornings with the kids became so much smoother. And consistently too, so that even now our mornings are rarely the struggles they used to be. And yes, even with just one hour to spare. Tell me in the comments: What is your biggest struggle with creating a morning routine for toddlers? I have taken in a 28 yr old mom with very defiant children, ages 3 and 7 both boys. They tear stuff up, will not mind, they cuss like little sailors, they get up a million times when u put them to bed no matter what you do. I will say they are alot better in the short week they’ve been here due to my being consistent and not wavering on what I say. If I tell them something I do it. They have been allowed to make deals with their mom to do things, like if she will lay down with them they will mind her. I’ve told her they need to be in bed by 8pm, and she is grown and doesn’t have to go to bed at 8, and they shouldn’t be allowed to tell her what deals they’ll make. Put them to bed at 8, do not let them get bk up. I’m at a loss as what to do with t hem because nothing seems to make an impact on the 3 yr o k d. Any gelp?